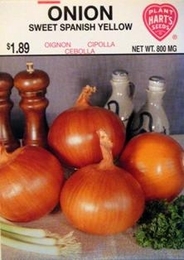 A popular onion used either raw or cooked, as a flavoring in salads, soups, sandwiches and stew. Spanish onions will grow quite large and sweet. This variety is not a winter keeper. Cultivate and draw up earth well around plants so they are fairly well covered at all times. Water regularly and fertilize every 4-6 weeks. 9,000 Seeds/oz. Plant 1oz per 100ft row, 4lbs of onion seed needed per acre.